Coastal erosion is a serious threat facing the maintenance and regulation of coastal ecosystems worldwide. Climate change has accelerated the intensity and frequency of hurricanes resulting in erosion and net sediment loss in coastal ecosystems. A number of prevention methods are used to minimize the impact of sediment loss, such as nature-based, low-impact methods that promote barrier beach and salt-marsh formation. Revegetation of dunes with native plantings has proven to trap and hold surficial sediments (Carter, R. W. (1991). This study compared the influences of American beachgrass (Ammophila breviligulata) in promoting dune formation versus different beach vegetation in Niantic, Connecticut. Data were collected on four beach-grass plots and four native plots every two weeks from August 9-November 26, 2016. Preliminary results indicate that native species plots had a steeper slope than the restored American beach-grass plots. There was an overall increase in the number of beach-grass clumps in high versus low slope plots indicating the requirement to couple culms with sediment deposition in restoration projects. Additional focus on sediment control coupled with revegetation is needed to achieve restoration goals. Coastal erosion is a dilemma facing many American beaches. The increase in sea level rise has pushed coastlines back and erosion of beaches has caused enormous challenges for beachfront properties. For example, in Niantic, Connecticut, a sea wall was built to protect the beachfront properties from waves during a hurricane. However, sea walls have shown to further damage the coastline so the beach erodes more and becomes flatter (Ruggerio, P, et al., 2001). A natural way to inhibit coastal erosion is the formation of dunes. When waves crash against the beach, they move large quantities of sediment. The sand moves back and forth on the beach and mostly stays on the beach. But, when the sand dries out, the coastal wind begins to have an impact. As the wind pushes the sand on the beach, it moves the sand in a jumping motion uphill called saltation. Dunes are usually made out of large sand particles, so the wind can easily move them into a dune formation. Once the particles start accumulating, they stay there and this process continues. It is a natural way a beach can repair itself after a storm hits. Since dunes are formed by wind blowing the sand into a concentrated area and accumulating (Doing, H, 1985). These dunes stop coastal erosion because when a wave hits, it absorbs the impact, which can delay the flooding. For gusts of wind, the sand is not being blown everywhere, but from the dune and back to the beach. In addition to wind, vegetation helps dunes to develop by trapping sand. Vegetation provides structure to the dune and helps trap loose sand and prevents erosion with its root system. One of the widely known and foremost species in the Northeast is American Beach grass (Ammophila breviligulata). American Beach grass has a type of root system called a rhizome, a continuously long stem that grows underground and sprouts lateral shoots. The plant has adapted such that when it is buried by sand, it will still grow and spread its rhizomes (Seliskar, D. M, 1995). Therefore, the American Beach Grass is adapted to withstand the thin deposits of sand that create the dune. American Beach Grass doesn't grow on every beach. Other common beach plants include Beach pea (Lathyrus japonicus), types of Salsola like Saltwort (Kali turgidum), and Sea Rocket (Cakile edentula). These plants are regularly found plants on the American coast, but they usually do not form sturdy dunes as well as Beach grass does because of the different root systems (Moreno-Casasola, P.,1986,). This study was conducted to see if American Beach Grass will create a dune and if its slope would be greater than those with different vegetation or lack of vegetation. Because of its unique characteristics such as the rhizome root system which provides structure for the plant growth to create a larger, more steeper dune, we hypothesize that American Beach Grass will form greater slopes of dunes compared to other plants, and thus protect the coast from coastal erosion. This study was conducted at an urban beach in East Lyme, Connecticut. It is located next to a boardwalk and the Niantic bridge. This location was picked because it had seen previous coastal erosion damage during superstorm Sandy and Hurricane Irene. To assess the effectiveness of American beach grass plantings to coastal dune restoration, I will survey 4 American beach grass plots (roughly 20ft by 5ft) and 4 control plots (roughly 20 ft by 5ft). The beach grass was planted in early April the plots held 50 pair of plants. The plants were placed in a herringbone pattern and the plots were placed based on two parameters: if there was vegetation and if a dune could properly form there. The beach was lined with patches of native vegetation and boulders put in by Amtrak train company which would hinder growth for the young beachgrass. Each plot was placed where little native vegetation was growing and where the boulders did not protrude greatly, which meant the plot could be established where no foot traffic would possibly kill the plants. The four control plots were evenly distributed between each beach grass plot. One plot was almost barren, and the other three have a variety of different species such as Beach pea, Cocklebur, Sea Rocket, and Salsola, in order to account for different growth patterns a beach can have. Each beach grass plot and control plot will be monitored biweekly from August 2016 to November 2016. Biweekly surveys will be used because they will show if there was a noticeable change on vegetation and dune buildup over the time within the two weeks. If a severe storm does hit this coastline in the time frame of data collection, once the storm has ended, data will be collected from the plots. Before the data collection starts, there will be a run through of how to take proper measurements of the plot, the correct identification of each plant, and how to use the slope apparatus to get accurate measurements of the dune slope. That way when data collection starts it will be collected correctly without minimal errors. Beach grass establishment—In each plot during biweekly surveys, observations on signs of biological or mechanical stress will be noted such as plants looking smashed or pulled, stems of beach grass will be counted which shows numerical growth among the plan, and the percent cover of beach grass will be measured using photo points. Also, beach grass beds will be mapped using GPS and GIS each season (e.g. summer, fall, winter). The mapping data is primarily for a data baseline to be used in future assessments of the beach. Inhibiting invasive species establishment—During biweekly surveys, I will also identify all other native and invasive plants to species in both beach grass plots and control plots. Using the photo points, I will calculate percent cover of invasive plants and other native plants in all plots. Retaining sand and preventing erosion—At beach grass plots and control plots, I will measure height of dune formation by short PVC tubes, with graduated markings, to place at selected locations within the planted and unplanted plots. Collection of height data will start in September 2016 because the method that is going to be used is still being developed. Increasing height of dunes in beach plots compared to control plots will show how the plants have helped with dune creation and erosion prevention on the beach. Taken together, this data will allow me to determine if the beach grass has acquired to its environment and how it is impacting the coastal urban beach. Comparison of beach grass plots to control plots based on their height of sand will help show the change of the dunes and if the beach grass is effective restoration method. In order to show the data over the collection time, line graphs will be made showing the control plots and the beach grass plots, and one with the average slope of each plot dune to show which plot(s) have the highest change in slope. Figure 1 shows the Niantic Boardwalk site of the study in 2017 taken from Google Earth. Figure 2 shows the Niantic Boardwalk site of the study in 1990 taken from ARCGIS. 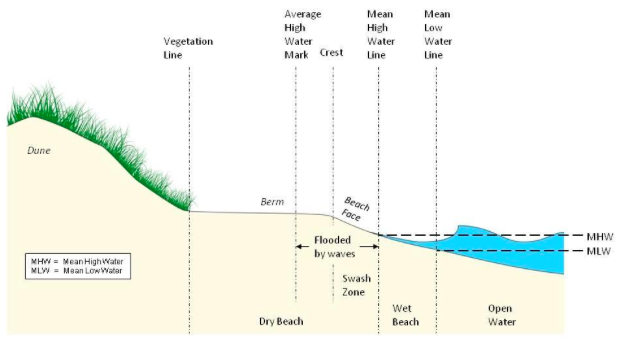 Figure 3 represents a typical beach profile. It shows how the dune vegetation is above the berm and how it creates a slope that retains sand (Sam, Y. H, 2014). Graphs 1 and 2 represent the beginning and ending slope of the planted plots. The varying blue lines are the planted plots and the varying red lines are the control plots. This graph represents the average change in slope for each plot. The control plots had a higher slope change than the beach grass. Based on the data collected in this study, it is shown that the average slope for the beachgrass (1.9) was less than the average slope of the control plots (1.95). This did not support the hypothesis. The transplanted beach grass in the juvenile stage did not stabilize the shoreline. The theory is evolving that there is a high importance to monitor beach grass in the juvenile stage. The beach grass had a smaller change of slope compared to the native species. This is possibly due to the native species being in the area longer than the beachgrass. The juvenile beachgrass did not have an established root system to trap sand on the shore. The slopes of the control plots (Avg. 0.75) collectively grew thus making the dune steeper. The beach grass plots had a change in slope (Avg. 0.5625) indicating that there was dune formation however the dune was less steep than the dunes in the control plots. The results showed that the native plots have a greater change of slope than the planted plots. Therefore, the evidence indicates the hypothesis was refuted. Graphs 1 and 2 show the beginning and end slopes for each plot. The blue lines represent the planted plots and the red lines represent the control plots. Graph 3 shows the average change of slope for each plot. It shows that control plots 1 and 2 have a greater change of slope than plots 1 and 2. This is possibly due to the native species in the control plots being established longer on the beach than the beachgrass. Control 3 showed no change in slope, the likely reason for this is because the plot was barren, so the lack of vegetation means there was no root structure that has been documented to be needed to trap sediment and stabilize the shoreline (Kucinski, K. J.,& Eisenmenger, W.S, 1943). Plot 4 and control 4 have the same change of slope possibly due to them being relatively close together so the variation in spatial difference was not present. 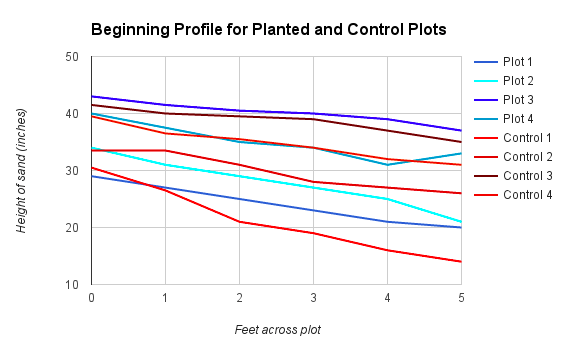 Graph 3 highlights that the change in slope for the control plots was higher than the change of slope for the planted plots. Beach grass in a juvenile stage does not have an established rhizomal root system. Once it matures, then the sediment can be trapped to stabilize the shoreline. This study helps focus on the importance of monitoring juvenile beach grass. The beach grass must reach the mature stage in its life in order to fully form dunes. There has been research done that highlights that vegetation can improve a steeper slope in dunes (Doing, H.,1985) and that American beachgrass has properties like its root system that make it the ideal plant for dunes (Natural Resources Conservation Service, 2014). These studies correlate what plant can do the best job of accumulating sand for the formation of a dune. There have also been studies on how the formation of dunes with the beach grass can help hinder coastal erosion when a storm hits (Kucinski, K. J.,& Eisenmenger, W.S, 1943). Therefore, American beachgrass is the ideal plant to form a strong dune that can withstand getting hit by a storm and continuing to increase dune formation. February). Cape American Beachgrass, 1-2. Retrieved November 30, 2016. Doing, H. (1985). Coastal fore-dune zonation and succession in various parts of the world.